For enabling snippets First you need to enable Enable Developer Tools experiments. Type chrome://flags in your address bar and hit Enter. Find Enable Developer Tools experiments and enable it. Click on the settings icon on the bottom-left corner of devtools. An overlay with black background will popup with lots of settings and tabs. After restarting the chrome, Open the devtools > switch to Sources tab and you can find a new member on the sidebar, “Snippets“. You can create new snippets by right click on snippets sidebar and choosing “New” from the context menu. 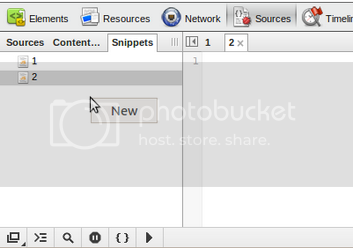 Now you can draft the snippet on the content area and save using Ctrl+S. Saved snippets will be available even after restarting the chrome. 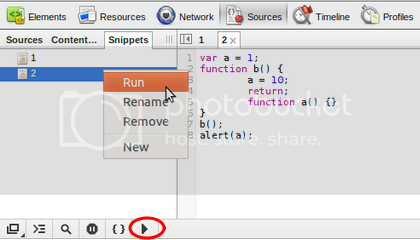 You can Execute the snippet by either right clicking on the snippet and select run from the context menu or select the snippet from the snippets sidebar and click the execute icon (marked in red). You are currently browsing the google-chrome category at PHPRepo.